The Ballard Avenue Historic District reflects the patterns of industrial growth in Seattle, as well as the city's Scandinavian heritage. In the 1870s and 1880s, several distinct communities were formed in the Puget Sound area that centered around the area's rich timber resources. A group of Seattle real-estate developers recognized an opportunity and purchased a large tract of land along Salmon Bay, and divided the property into commercial, residential and industrial lots. 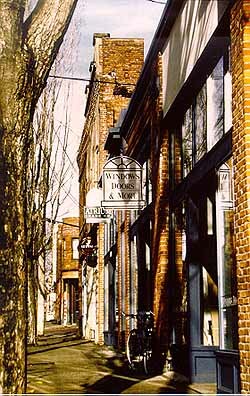 Eastern companies were encouraged to establish industries in the new town named Ballard. J. Sinclair built Ballard's first mill in 1888, establishing an important foundation. In the following year Michigan's prosperous Stimson Company built its first mill in the region, which turned out to be fortunate timing, for the Great Seattle Fire that year created an immediate demand for supplies. By 1895, Ballard claimed to be the center of the world's largest shingle industry and, by 1904, was producing an incredible 3 million shingles per day. Many of the mill jobs were filled by Scandinavian immigrants, establishing an ethnic influence that remains today. The area's success spurred the construction of a strip of commercial buildings north of the shingle mills--two and three story Italianate brick banks, retail stores, saloons, and hotels--that form the core of the historic district today. Incorporated in 1890 with a population of 1,173, Ballard took just five years to grow into a bustling town of 10,000 that supported sizable foundry and fishing industries, in addition to the tremendous shingle industry. Annexed in 1907 by Seattle, Ballard received another boost in 1916, when the Army Corps of Engineers dredged Salmon Bay and allowed the growth of a commercial fishing fleet. Ballard continues to be a unique Seattle neighborhood, retaining its late 19th-century flavor while adapting to changing times. The Seattle neighborhood of Ballard is located in the Northwest corner of Seattle, just north of Salmon Bay. The buildings of the Ballard Avenue Historic District span the full length of Ballard Avenue, NW. All of the commercial buildings within the district face Ballard Ave., and are generally open to the public. For more information visit the district's website.